This is the last year students will attend Bayview School. It is one of three local schools that closed at the end of the June. 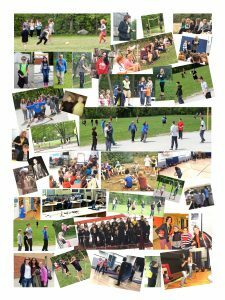 To create a permanent record of the year, including photos of students, staff, activities and clubs, the school produced a yearbook that was printed by Qwik Print. Preparing a yearbook is no small task and depends a lot on how ambitious your plans are. 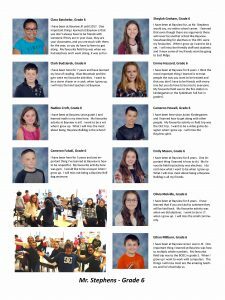 The Bayview School book was prepared by volunteer Kerri Walpole using Microsoft Publisher, one of the most commonly used programs for these projects. Although not as capable as Adobe InDesign, Publisher offers better page layout and formatting capabilities than Word. Regardless of the software you use, organizing and creating a 60-page book is a big task. We had no problems getting the pictures and used the CD of pictures for the staff and students that were taken near the beginning of the school year. 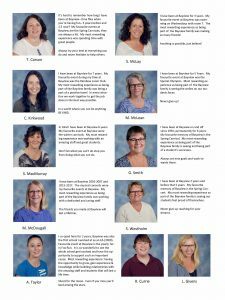 The only issue being with this was that some students that were on the CD had left and other students had joined our school so we had to get a few extra pictures taken before the yearbook went to print and make sure those who were no longer at Bayview were removed. Luckily I had two young editors who could tell me who had left or joined the school population! I developed 5 questions for the children to answer and let the teachers distribute them. Some filled out the questionnaires in class as an assignment, some were allowed to take them home to fill out, of course not all of those ones were returned. I made a list of who I needed answers from (even some teachers) and booked myself time to come into the school to grab answers from those who had not submitted responses. I spent a lot of time one morning in the kindergarten classrooms as they were not able for most part to write their answers themselves. What were some of the biggest challenges you faced in creating the book? The yearbook was a huge undertaking and I essentially did it all myself, with the only help coming from my family. If I were to do it again I would have others helping (chasing people, typing in the comments, doing layout, compiling the history, arranging pictures etc.). I thought I had given myself lost of time to compile the yearbook but it was a lot more work than I had envisioned so found near the end that I was a bit panicked. The colour (as you warned me) was not the true colour for what was going to be printed so there was a lot of fiddling with pictures to try to get the best picture possible. What help did you get on the project? Jamie took the club and team photos, which was disorganized at best even though the staff and students were aware the day we would be in doing these photos. Our eldest daughter took pictures at different school events, we all had cameras and phones for the closing ceremonies and spring carnival to get as many cool shots as we could. Our youngest looked for duplicate pictures in the yearbook and let me know of missing students and students no longer at Bayview. My mother edited for grammatical errors. Our Office Manager helped in chasing people down for their questionnaires, was vital to making sure we had permission to use photos and name the kids due to privacy policies and in making sure the names of everyone in the yearbook were spelled correctly. Our SCC gave me the go ahead and let me just do it without question which was nice not having too many opinions and people to make happy. Our Principal okayed the content before going to print. You and your team were great! You worked through with me on how it should look, about shorter paragraphs, picture size etc. Meeting with you at the beginning of the project was key to the yearbook being such a success and gave me the confidence to do it without asking for lots of approvals. The draft copies that Jennifer ran were great to see the colour of the pictures, how the layout was, how it was all coming together. I prefer to look at and edit a hard copy and that was best as my laptop had different colours than the final printed images. Qwik Print is creating a page template document for both MS Publisher and InDesign that clients can obtain to help them create a yearbook or membership directory for their church or social group.